Ah, repetition. I love you. Playing a bit of catch up and keeping it simple by focusing on the words + photos and setting myself up for success with one single design for my journaling cards repeated for each day of the week. It seriously makes it so easy to get the spread done and the story told. The products I used in this spread are my Highlighted Products Of The Month and are available for free shipping/$2 international when purchased before 5/11/16 at 11:59PM EST. Check out my recent newsletter for all the details. I'm telling you, I really do love creating a series of cards like this and then just filling in the stories. Simple and easy and consistent and I love how it all works together. You'll also probably notice that I only added one thing on top of any of the photos (a stamp from the Wild Story Kit™) - I like including spreads like this in my overall album as well. Small Manila Tags + Sans Serif Alpha stamp set + Stories Washi Tape + Black Staz On + rolling date stamp + white cardstock = super easy way to create homes for your stories. Mixed Alpha Stamp + Black Staz On + rolling date stamp + a bit of Anna's writing = super simple title card. I seriously love how that card turned out. I'm a long time fan of black + white and a very small bit of color. 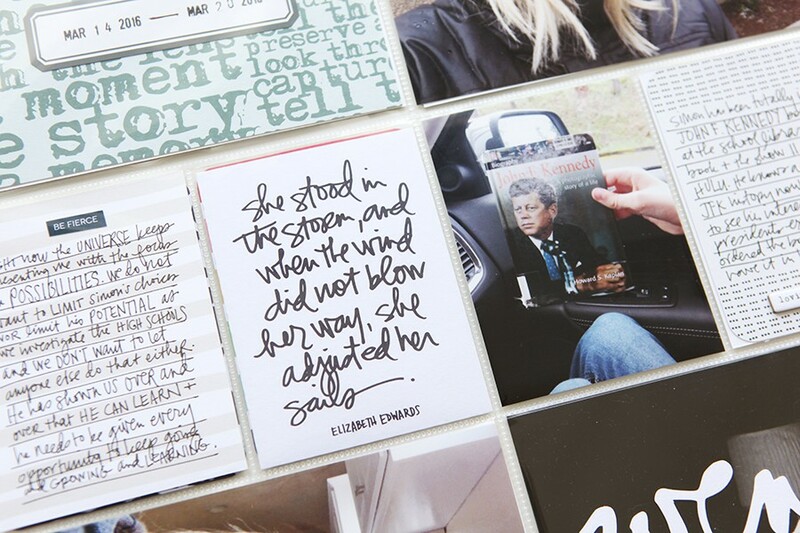 Print those photos + get them in the pockets + create a series of cards + add words = life documentation. Beautiful as always. Thanks for sharing! I am one avid reader that has noticed you have been quiet on your blog recently - was hoping it was just because you have been having a fabulous holiday. Love your products and all that you do. Thank you. Michelle. Wow, oh Wow! Simple. Awesome! Love it, as always. Funny enough I was listening to one of the Lens of Joy presentations today, where you mentioned the story of your Clematis that died, and how sad you were about it... and there it is, in this lay-out! Interesting timing..So happy it was only dormant, and back in bloom. Love the use of the tags and your stamps! I have to say I have used tons of stash since taking your Project Life workshop/class. The first thought I had when seeing this post today was...Yes!...I can use up those tags! Such a different mindset post workshop. Thank you. I too have noticed the quiet and hope you will be sharing more soon. I miss reading more of your posts. Your work and style is motivating and inspiring. I've been spending ALL WEEK pining over the fact that I don't have manila tags but just NEED them in one billion sizes, then lo and behold! #YAS! I love this tag idea. This is my dream post -- such a great design that can be easily repeated thanks to that new and awesome "shop this post" feature!! LOVE LOVE LOVE it! THANK YOU for sharing your incredible talent with us. I love your PL pages. They always inspire me to work on mine! Wow. You never disappoint in the inspiration department! Thanks Ali. I love this layout. I get so much inspiration from looking at what you have done. I am ever so thankful for all that you've shared here on your blog - you have changed many lives for the better! 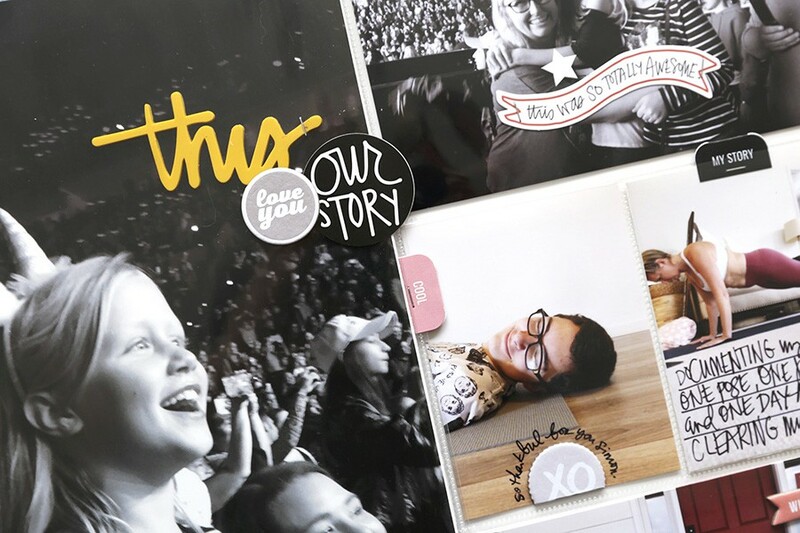 PS Happy National Scrapbooking Weekend and Mother's Day! Heart the photo of Simon riding his bike...the shadow in there! AWESOME!!! Glad to hear you are having a beautiful spring. Sure puts you in a different place when the weather is warm & sunny!! Happy Mother's day to you Ali!! ENJOY! Great to see you with lots of posts this week! I have missed reading your posts each morning, and have been hoping that everything is ok. I participated in December Daily this year for the first time ever, and have become completely hooked on your creative and logical style of scrapbooking and living life. Great site ,i like the interface of your site,and here are some nice pics.Thanks for sharing.